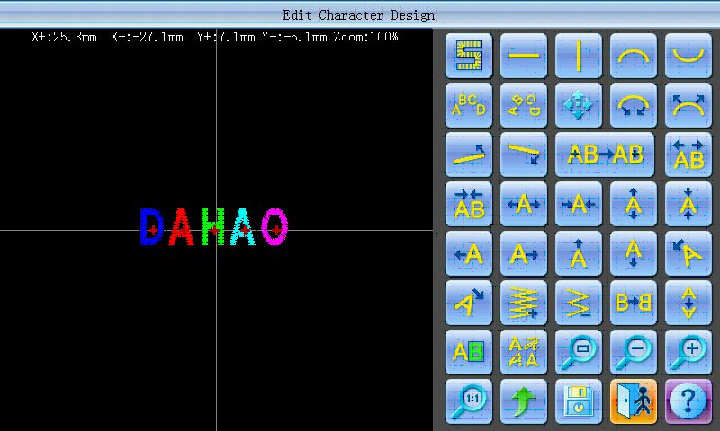 System can generate letter design based on the built-in letter database..
Click to enter letter design parameter input interface. After opening the window of parameter input, user can enter letter input interface automatically. Click certain parameter in the list, and then you can input parameter into the window in the right side of interface. 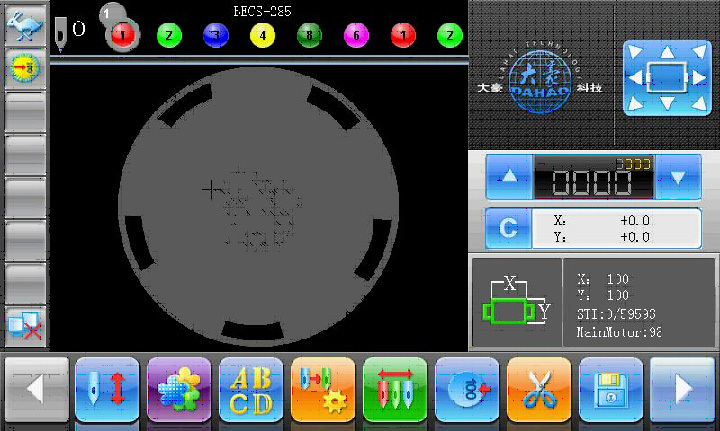 Parameters displays at left side of the screen, while the input window is at the right. After user adjusts the value, they also need to click for saving. “String”: the letter list that will be embroidered. “Font”: means letter font for embroidery. The font selected here will be applied to all the letters. If you want to set font for an individual letter, please do operation in letter design adjustment interface. “Arrange type”: the arrangement method of letter. 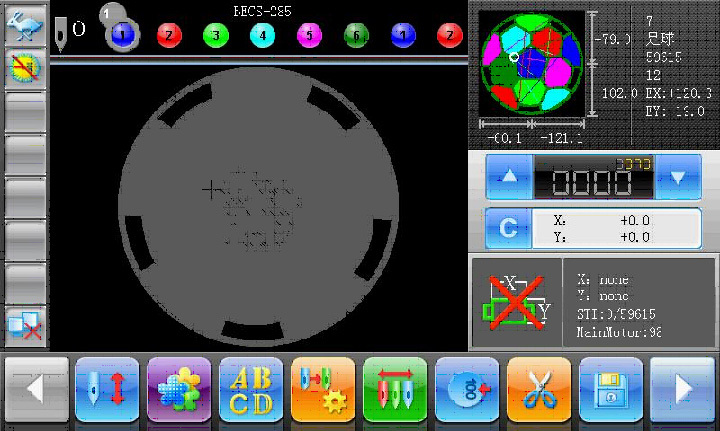 It supports 4 types of arrangement, including “horizontal” “vertical” “up arc” and “down arc”. “Char space”: means space between letters, the unit of which is 0.1mm. “Char angle”: means when the arrangement method is arc, whether the angle of the each letter will change along with the position of arc. “String rotate angle”: the rotating angle for whole letter string. “Char height scale”: increase or reduce the height of letter. “Char width scale”: increase or reduce the width of letter. “Density”: means distance between each stitch within letter design. The value is smaller, the density is higher. “Char rotate angle”: rotating angle of each letter to its centre. “Change color between letters”: whether to add color-changing code before each letter. After setting letter design parameter, use can click to enter window of” letter design adjust”. Click to quit the function of letter design. 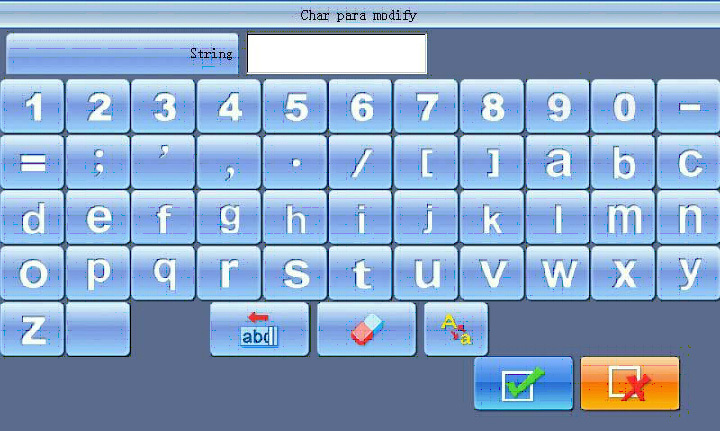 The operation key is divided into 8 rows in the screen, the first three rows are the function keys for adjusting the arrangement of the letters(for whole rank), the second three rows are the keys for adjusting the selected letters, and the last two row are the function keys for the function of view and files. The centre of screen is the area to show letter design. 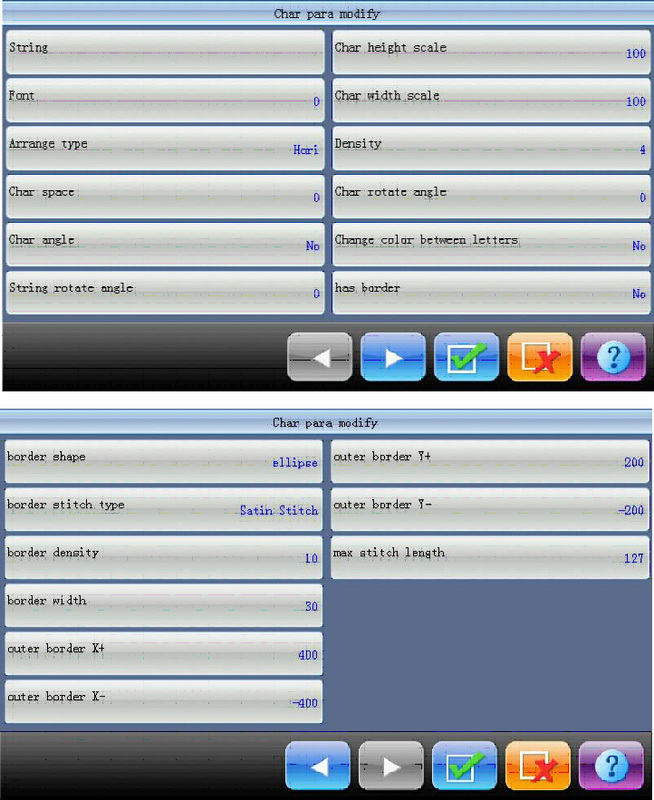 Generally, user should set the parameters, such as whole arrangement method of letter string, rotate angle of letter string and interval of letter string (The keys of the first three rows at the right side of the screen); select the very letter, and then adjust the arrangement parameter of that individual letter. Letter design display window: the crosses at centre are the coordinate; intersection is origin (0,0). The letter rank surrounds the origin automatically. “Stitch Form”: show/hide the stitch form. Hiding the stitch form can improve operation speed. “Move”: Move the letter design manifestation window, to check different part of thedesign. Clicking this key can show or hide the 5 direction keys that are used to move the diagram. “Left”, “Right”, “Up” and “Down”: Move letter design toward each direction. “Center”: Move the design to the original position. “Center”: Scale up/down the diagram, so as to show the whole design for checking. “Reduce”: Reduce to show the window of letter design. “Enlarge”: Enlarge to show the detailed part of the letter design. “Actual”: Show the letter design in the actual size. At this time, the size of design in interface is equal to actual size. “Save”: It is used for saving the edited letter design. 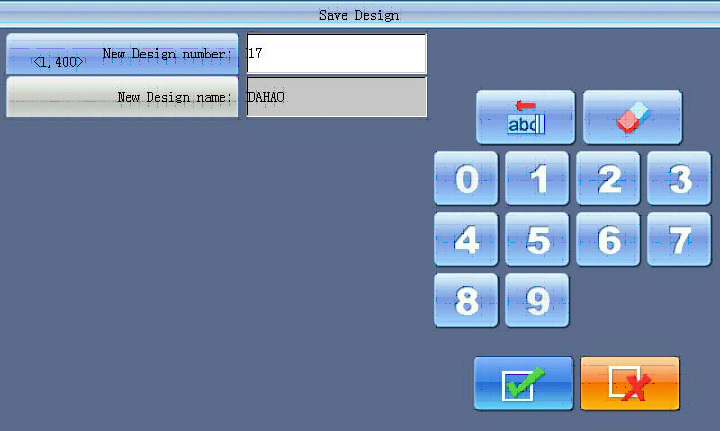 After clicking that key, the system will show the window where user can input the design number design name. According to need, change the design name and design number (the serial number are not recommended for modification generally), then click confirmation to start saving. “Exit”: Quit from “Create Letter Design”. “Help”: Help for “Adjust Letter Design” interface. “Selection Switch”: switch the selected letters. User has to select a certain letter and then to carry out the edition for it. The red“＋”in the center of letter means the letter has been selected . The system will pick out all letters as default. After user clicks the “select switch” key, the system will pick up the first letter, and then pick up the second, depending on this kind to push. After the system picks up the last letter, if user clicks “select switch”, the system will pick up all the letters again. “Increase Width”: Increase width of selected letter. “Reduce Width”: Reduce width of selected letter. “Increase Height”: Increase height of selected letter. “Reduce Height”: Reduce height of selected letter. “Move Left”: Move the selected letter to left. “Move Right”: Move the selected letter to right. “Move Up”: Move the selected letter to upper side. “Move Down”: Move the selected letter to down side. “Anticlockwise Rotation”: Use the letter as centre (“＋” in the centre of letter), and rotate the selected letter anticlockwise. “Clockwise Rotation”: Use the letter as centre (“＋” in the centre of letter), and rotate the selected letter clockwise. “Increase Density”: Increase the stain stitch density of the created letter design. “Reduce Density”: Reduce stain stitch density of the created letter design. “Horizontal Overturns”: Overturn the selected letter horizontally. “Vertical Overturns”: Overturn the selected letter vertically. “Color-changing switch”: Set or cancel the color-changing before the selected letter. “Change Font”: Change font of selected letter. 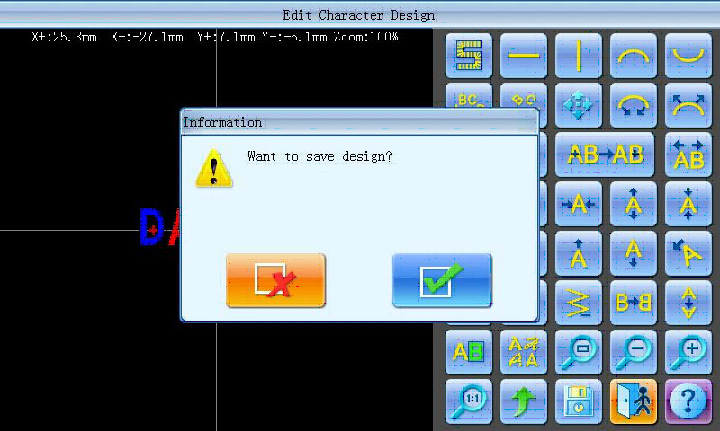 After user clicks this key, the system will give the dialog window for selecting font, choose one you wish, and confirm the change. “Return” key is use for returning the window of letter design parameter input. 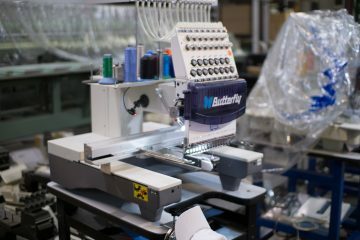 If you need to change embroidery letter string, you can click this key to turn back to the previous interface to carry out the modification. All of adjustments for individual letter in this window will disappear. After finishing the letter design edition, user can click number and new design name in the pop-up window, then click key. Appoint the new design key to save them. After the confirmation of the saving, the system will return to the interface of “Adjust Letter Design”. If you don’t want to edit letter design, then press to exit. System will show the following message. Press to save, or press to return to “Other Design Management Functions”.